Robert Burns Lives! attains its 250th number. Its founder, Frank Shaw, whom we are proud to call a friend, has been editing it for much longer than any other current editor of a Burns-related periodical, and under his benign direction it has come to occupy a unique position among the several different periodicals and websites devoted to Robert Burns and the Burnsian community. Over the past fifteen years, the 250 articles have covered a remarkable variety of aspects of Burns. They have been contributed by an equally remarkable range of writers from Alex Salmond (no. 40, 2009), Ross Roy (repeatedly, from no. 6, 2003) and Eddie Reader (no. 37, also 2009), through virtually every prominent Burns scholar of the past forty years, to essays from Burns's Ukrainian translators, and even a few non-Burnsians like David Shi, president of Furman University. They have been linked by Frank’s own enthusiasm and curiosity, building a community of interest in the broader significance of Robert Burns and what he means in the 21st century. These things don’t just happen by themselves, and it seems worth saying thank you. Frank (as we all know him) started Robert Burns Lives! in print as a column in The Family Tree in September 2002, and it soon became available also on the web as part of Alastair McIntyre’s site Electric Scotland. Publication on the Electric Scotland site, with its own front or index page, gave Robert Burns Lives! more of its own identity as well as wider distribution. It reached article 50 in April 2009, article 100 in November 2010 (Frank himself writing on the centenary of the Atlanta Burns Cottage), article 150 in August 2012 (a tribute by Bill Dawson), and article 200 in July 2014. To celebrate that 200th number, Alastair McIntyre wrote an excellent retrospective, giving the history of Robert Burns Lives! with extracts both from the articles themselves and from Frank's characteristic and generous introductions. In many ways, Robert Burns Lives! is an exemplary story of how its editor has successfully transitioned through, and his publication has benefitted from, wider changes in how we all communicate. It began in print, and moved to digital publication, shedding its early dependence on subscriptions and mail distribution, and gaining flexibility in article length and publication schedule and frequent colour illustration. In digital-only form, Robert Burns Lives! is free and accessible immediately on publication day to readers worldwide. But Frank’s willingness to adapt to technological change is only part of RBL’s success. From the beginning Frank has sought out contributors personally. When he met someone at a conference, or heard a good speaker, or read an interesting book and could track down its author, he has asked them to contribute. As Ross Roy used to do, he has encouraged young scholars to share accounts of their research, and so begin the healthy process of engaging with a wider public. And he has written himself, when books or news items or things he saw in his travels with Susan caught his attention. Almost everything he has published is notably more readable than what commonly appears in academic journals, and it is made even more readable by his introductory comments on the contributors and their topics. Some of the items on Robert Burns Lives! have been chiefly of immediate interest, but a remarkable number of the 250 are clearly of lasting value. For this 250th number, instead of repeating the story told in Alastair's excellent article three years ago, four of us who are editors of other Burns-related publications asked Frank if we could mark the occasion by trying to pin down how Robert Burns Lives! has changed editorial attitudes and broadened horizons for all periodicals serving the Burns community. 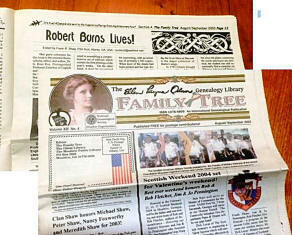 The publications we edit are the annual Burns Chronicle, edited by Bill Dawson for the Robert Burns World Federation, the longest-running Burns periodical in the world, which also carries each year the biggest concentration of research-based articles on Burns; its bimonthly counterpart, and the newest of Burns periodicals, the RBWF Newsletter, edited by Mike Duguid, which gives timely illustrated reports of Burnsian activities; and the two leading academic journals in Scottish literature, both now appearing twice a year, Scottish Literary Review, edited by Gerry Carruthers of the University of Glasgow, and Studies in Scottish Literature, jointly edited by Patrick Scott and Tony Jarrells of the University of South Carolina. All four of the journals now have, in different ways as noted below, a digital existence as well as one in print or hardcopy, a development for which Robert Burns Lives! and Electric Scotland showed the way. On the academic end, of course, there are many other journals that occasionally carry the odd Burns article, and with Web publication, and now social media, there are several other interesting Burns sites that also give Burns news (such as the RBANA Newsletter) or even quite substantial articles; the Glasgow Centre for Robert Burns Studies, for instance, hosts a site Editing Burns for the 21st Century, with news and discoveries from the team working on the new Oxford Edition of Robert Burns. The ASLS’s online e-zine, The Bottle Imp, has Burns articles and reviews from time to time. 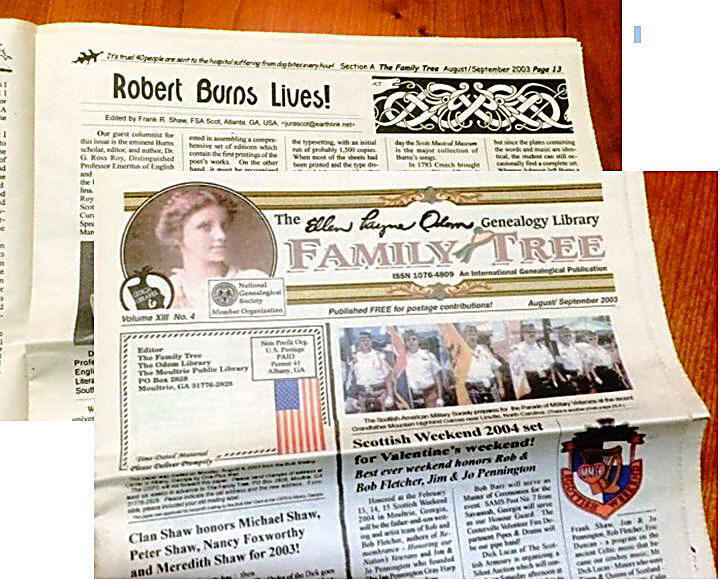 Newsletters and websites maintained by individual clubs provide an increasing variety of substantive content as well as news; examples are the articles on the Irvine and Calgary Burns Club sites. But the four journals discussed here represent a full spectrum from heavily-documented research articles on specific poems or aspects of Burns’s life to the briefer reports about Burns discoveries, events and people. This is the spectrum of interest that through Robert Burns Lives! Frank Shaw has extended and made into a worldwide community of readers. All four of us have ourselves contributed articles to Robert Burns Lives!, and the brief reflections and tributes below attempt to say what Frank’s success with it has meant to us and to Burns studies.